Haryana Engineering Admission 2018: Applicant who wants to get admissions in Engineering Programs. The admission process will be based up on the JEE Main 2018. The Haryana Admission conducted by the Haryana Technical Education Society (HSTES) every year for the admission. Before applying for the Haryana B.Tech Admission Form applicant should have to meet the eligibility criteria. The applicant will get here all the process to apply for the Haryana Engineering Admission Form 2018. The eligible applicants have to submit the completely filled application form of Haryana Engineering Admission Test 2018 on before the due date. The admissions will be based up on the JEE Mains scorecard. Firstly applicant has to click on the official website of the Haryana Engineering Admission. Log in with the help of JEE Main Roll Number. Now fill the Haryana Engineering Admission 2018 Application form very carefully. Then clicks on the submit button and submit the application form. Take a print out of the application form for the further uses. The Haryana Engineering Admission is conducted by the Haryana State Technical Education Society under the DTE for B.Tech Engineering Degree Courses in the state of Haryana. Candidate admission will be the basis of the JEE Main 2018 score and 10+2 Class scores of the student ratio of 6:4. Candidate will get ere the important dates of the Haryana B.Tech Admission Important Dates Following are the important dates which are given as follow. Above given dates will are given in the table are not conform dates after the official notification we will update all the dates after the official notification. A candidate who is planning to take admission in Haryana Engineering Admission they all are has to clear the eligibility criteria. The Haryana Engineering Admission 2018 Eligibility Criteria are given as follows. The applicant is applying for the post they have to meet their eligibility criteria. Candidate should have to pass their 10+2 education qualification from the recognized education board or any university. Applicant has to pass 10+2 with the subject of Physics and Mathematics as compulsory subjects and the subject of Chemistry, Bio- Technology, Computer Science, Biology/ Informatics Practices/ Multi Media and Web Technology any of them this is the optional subject. So here is the list of the Haryana Engineering Admission 2018 Participant Institute which is given as follow. In the Haryana Engineering Admission 2018 Counselling Process, the department will allocate the seat to the eligible applicant. Following are the Haryana Engineering Admission 2018 Counselling process which is as follows. Firstly candidate will have to register for the online choice filling. After getting register applicant has to fill all the asking details. In the Haryana Engineering Admission 2018, there is only two round of the counseling. Pay the Counselling fees through debit, credit or by using the net banking. In the counselling, the department will allocate the seat to the applicant on the basis of the final list allotment. The department will allocate the seats to the candidate after the final list. All the selected and the eligible applicant will get the seat. The Haryana Engineering Admission 2018 Sear Allotment 2018 is clear through the official notification. The candidate has to report to the college on before the given time. Reporting in the allocated college with all the original document. The candidate also has to pay the admission fees. After that candidate can join the college. This is the part of the admission process. To get admission applicant have to be qualifying the 12 class as well as JEE Main 2018 examination. 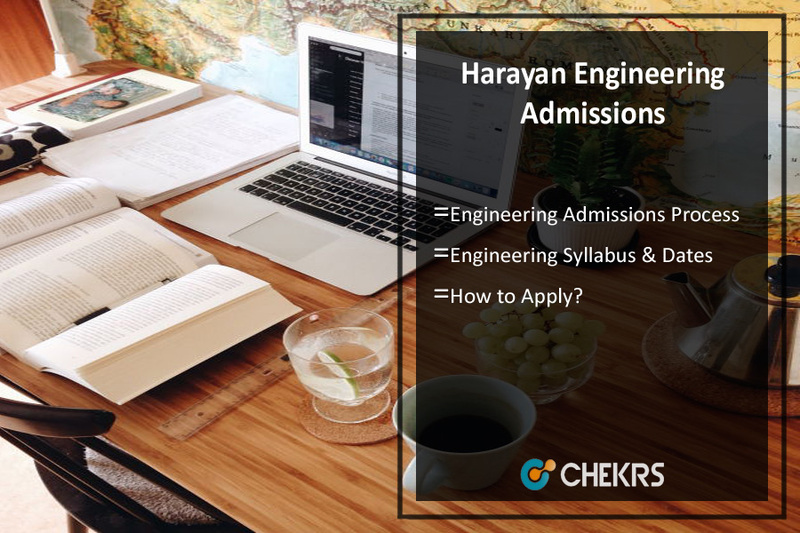 Here applicant will get the latest information of the Haryana Engineering Admission like eligibility criteria, Application process, and many another process which are given down applicant can refer this while applying for the Haryana Engineering Admission. The candidate who wants to know more about the Haryana Engineering Admission they just have to click on this Haryana Admission 2018 by clicking here applicant will get all the latest information about the entrance exam of the engineering.